Fabrice Muamba has revealed for the first time the dramatic moments before he 'died' in front of thousands of stunned football fans. The Bolton Wanderers midfielder said he knew something was seriously wrong when 'I could see Spurs running around in the distance and saw two Scott Parkers and then two Luka Modrics'. Muamba suffered a cardiac arrest and his heart stopped beating naturally for 78 minutes after he collapsed unconscious during the FA Cup quarter-final at Tottenham on March 17. The first feeling of being unwell came when he felt slightly dizzy towards the end of the first half. 'It wasn't normal dizziness - it was a kind of surreal feeling like I was running alongside someone else's body,' he told The Sun. 'Then I started to see double. It felt almost like a dream. 'The last thing I heard was our defender Dedryck Boyata screaming at me to get back to help. 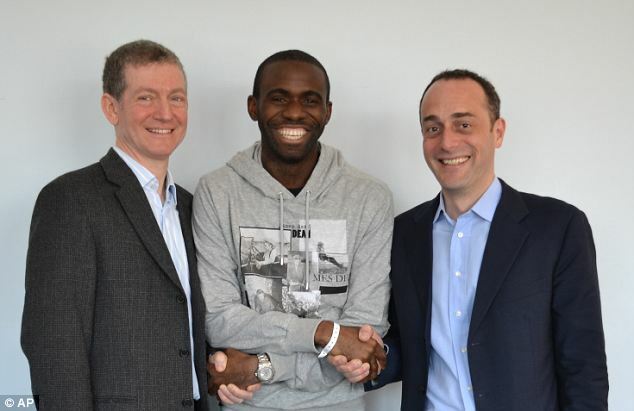 Muamba, a devout Christian, stunned doctors after coming back to life and was fit enough to walk out of hospital just a month after the ordeal. The 24-year-old described his astonishing recovery as 'more than a miracle'. In an interview, Muamba revealed he asked God to protect him before the cup clash, which was abandoned after his collapse. Muamba said: 'Someone up there was watching over me. What happened to me was really more than a miracle. 'On the morning of the game I prayed with my father and asked God to protect me - and he didn't let me down. I am walking proof of the power of prayer. The former England Under 21 star, who has had an electronic device implanted in case his heart stops again, said he had no recollection of the frantic treatment he received on the field or of being rushed to the London Chest Hospital. Among those who battled to keep him alive was Dr Andrew Deaner, a cardiologist and Tottenham fan who left his seat in the crowd and rushed on to the pitch. Muamba, who was unconscious for three days following his collapse, paid tribute to the doctor, saying: 'It was pure chance that Dr Deaner was in the crowd that day. I owe him everything. Muamba has been recovering with his three-year-old son Joshua and fiancee Shauna Magunday at home after being discharged from the hospital a week ago - almost a month to the day after he suffered the cardiac arrest. It is not yet known if he will make a return to competitive football.